This article was published in it's original form at nofibs.com.au. Australia's climate targets and climate action mechanisms were under the international microscope in Bonn today and found to be very unambitous, with veiled criticism of the inadequacy of Australia's policies in terms of comparative global action and failure to address fair and equitable global outcomes. 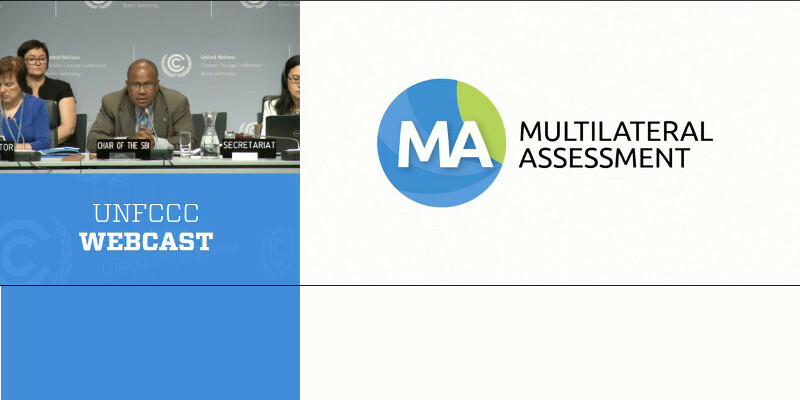 In the leadup to Paris climate conference in December there are a number of preparatory meetings and a multilateral assessment process whereby countries can ask questions of each other's climate targets and climate action mechanisms. Going into the climate conference in Bonn, Australia had a list of 29 pages of questions and answers, far more than any other nation. There were further questions asked in person at the session, and mostly very inadequate responses by Australia. "Countries are very interested in knowing whether the Emissions Reduction Fund will result in mitigation comparable total in size to the [Emissions Trading Scheme] in which it replaced," the US delegation asked. "Can you share with us some additional details [on] how Australia ensures the mitigation results of this policy are sufficiently large to achieve your objectives?" Peter Woolcott answered that the Abbott government's first auction had been highly successful. "We are fully convinced as a government that we will meet our 2020 targets," Mr Woolcott said. "We now have the legislation in place which will allow us to do so." Oxfam Australia’s climate change policy advisor Dr Simon Bradshaw was watching the questioning and released a media release shortly after. “With almost all major economies determined to reach an affective global climate agreement in Paris in December, concern is clearly growing over the Australian Government’s low level of ambition so far, and whether the government has the policies to meet even its existing and woefully inadequate emissions targets,” Dr Bradshaw said. According to Bradshaw some of the strongest challenges came from China and South Africa, which directly confronted Australia on the fairness of its emissions reductions targets, claiming it demanded more of others than it was willing to deliver. Brazil's line of questioning failed to extract information on how Australia’s Direct Action approach can achieve substantial economy-wide emissions reductions. At one point in responding to Fiji, Australia claimed that it fully recognised and appreciated the Pacific island nation’s vulnerability to climate change ... before then defending describing its inadequate target of reducing its emissions by 5 per cent by 2020 as “fair and equitable”. “Reaching a new global climate agreement depends above all on building trust, accountability and a sense of shared commitment between governments,” Dr Bradshaw said. “There is still time for the Australian Government to turn around its steadily worsening reputation in international climate negotiations. Mostly Australia failed in providing adequate answers to other countries questions. However, one significant concession was made in regard to the controversial Emissions Reduction Fund, when Australia admitted that not all of the emissions reductions purchased so far will be achieved by 2020. Erwin Jackson, Deputy CEO of The Climate Institute, was equally scathing about Australia's disappointing answers. “Disappointing responses to questions from other countries on the domestic policy framework fudged the fact that the government has significantly wound back renewable energy investment, and inflated the impact of its actions to 2020 without providing any estimate of the pollution reductions it will deliver.” he said in a media release. The Bonn conference is part of the lead up to the Paris climate conference in December. Jackson stressed the importance of transparency and accountability as key trust builders between governments. As Australia is clearly not being forthright with other nations, it is undermining its case for even greater accountability on national actions as part of the Paris outcome. “Part of a positive outcome in Paris will be an agreement that all nations - developed and developing - are transparent and clear on their actions. Australia risks failing the first hurdle.” said Jackson. Australia has still to put forward it's INDC document which outlines its post 2020 climate targets. It is expected Australia will announce its post-2020 pollution reduction target in July. “Australia has agreed that when it announces its new post-2020 emission targets the government will show the international community how it is a fair contribution to avoiding the 2ºC increase in global temperature. This will be the key benchmark for the new target and test if the government can look beyond a future where our nation remains dependent on outdated polluting technologies," concluded Jackson. The Climate Action Network have given a substantial background commentary on Australia's written responses labeled: Australian climate policy: lies, damned lies and statistics. As I said, 29 pages of questions and answers up to 31 May 2015, quite a few of them quite technical but many are quite straight forward. Read the Questions and Answers PDF or find other documents on the Multilateral assessment process Australia at the UNFCCC site. 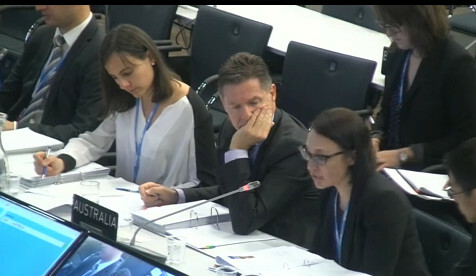 US in Bonn #SB42 asks Australia how emissions reductions from Aus govt direct action compares with the ETS that it removed. John Englart (@takvera) and his teenage daughter (@climateteen) will be travelling to Paris to report on the United Nations COP21 climate talks from November 30 to December 12 (including for Nofibs), and in particular what role Australia plays in those negotiations. Over $1400 was successfully raised from 20 backers through crowdfunding to help meet their living costs while covering the climate talks.